Along with winning the Oscar for Best Picture, the greatest achievement a film can receive is to be added to the National Film Registry. To qualify it must be at least ten years old and the National Film Preservation Board must find it to be “culturally, historically or aesthetically” significant. It's that time of year when a batch of new classics, some well-known and some far from it, are set aside to assure they are around for future generations. So don't expect to find Soul Plane on the list. I'm going to rattle off some of my favorites that made the cut, and there are a ton of them. The Goonies pretty much had to be there, didn't it? And the same goes for Die Hard, one of the ultimate action movie franchises and holiday movies, so it fills two niches. A film I truly love and is still relevant today, Ace in the Hole, was added to the Registry. The same goes for Superman, which laid the groundwork for the superhero movie dominance we've seen over the last decade. The powerful civil rights documentary 4 Little Girls, La Bamba, Guess Who's Coming to Dinner, and Christopher Nolan's Memento all deserve to be there and I don't think there will be any beef with that. Oh, and Titanic got in. Eh, I guess so. Some people like it and I hear it did okay at the box office. See the full list below! “Boulevard Nights” had its genesis in a screenplay by UCLA student Desmond Nakano about Mexican-American youth and the lowrider culture. Director Michael Pressman and cinematographer John Bailey shot the film in the barrios of East Los Angeles with the active participation of the local community (including car clubs and gang members). This street-level strategy using mostly non-professional actors produced a documentary-style depiction of the tough choices faced by Chicano youth as they come of age and try to escape or navigate gang life (“Two brothers…the street was their playground and their battleground”). In addition to “Boulevard Nights,” this era featured several films chronicling youth gangs and rebellion — “The Warriors” (1979), “Over the Edge” (1979), “Walk Proud” (1979) and “The Outsiders” (1983). The film faced protests and criticism from some Latinos who saw outsider filmmakers, albeit well-intentioned, adopting an anthropological perspective with an excessive focus on gangs and violent neighborhoods. Nevertheless, “Boulevard Nights” stands out as a pioneering snapshot of East L.A. and enjoys semi-cult status in the lowrider community. Disney’s charming, trademark animation finds a perfect subject in this timeless tale of a little elephant with oversize ears who lacks a certain confidence until he learns — with the help of a friendly mouse — that his giant lobes enable him to fly. Disney’s fourth feature film gained immediate classic status thanks to its lovely drawing, original score (which would go on to win the Oscar that year) and enduring message of always believing in yourself. An important documentary concerning America’s civil rights struggle, “4 Little Girls” revisits the horrific story of the young children who died in the 1963 firebombing of the 16th Street Baptist Church in Birmingham, Alabama. Director Spike Lee first became interested in the story as a student at NYU when he read a 1983 New York Times Magazine article by Howell Raines. Lee combines his experience in fiction filmmaking with documentary techniques, sensitively rendered interviews, photos and home movies to tell the story. The timing of this production was important due to the ages of the key witnesses and relatives and the need to refresh viewers’ memories regarding a dark period in U.S. history. Longtime Corpus Christi, Texas, residents Antonio Rodríguez Fuentes (1895-1988) and Josefina Barrera Fuentes (1898-1993) were very active in their local Mexican-American community. Their collection of home movies — mostly from the 1920s and shot on 9.5 mm amateur film format — are among the earliest visual records of the Mexican-American community in Texas and among the first recorded by Mexican-American filmmakers. As with the best home movies, the images provide a priceless snapshot of time and place, including parades, holidays, fashions and the rituals of daily life. The beautiful images also reflect the traditionally fluid nature of the U.S.-Mexico border. The collection is a joint project between the Texas Archive of the Moving Image and Texas A&M University-Corpus Christi. Winning the 1947 Academy Award for best picture and considered daring at the time, “Gentleman’s Agreement” was one of the first films to directly explore the still-timely topic of religious-based discrimination. Philip Green (Gregory Peck), a Gentile, is a renowned magazine writer. In order to obtain firsthand knowledge of anti-Semitism, he decides to pose as a Jew. What he discovers about society, and even his own friends and colleagues, radically alters his perspective and throws his own life into turmoil. Director Elia Kazan masterfully crafts scenes that reveal bigotry both overt and often insidiously subtle. The film was based on a book by Laura Z. Hobson. The fingerprints of executive producer Steven Spielberg visibly mark every second of “The Goonies,” with the plot sporting a narrative structure and many themes characteristic of his work. Spielberg penned the original story, hand-selected director Richard Donner and hired Chris Columbus (who had written the 1983 “Gremlins”) to do the offbeat screenplay. With its keen focus on kids of agency and adventure, “The Goonies” protagonists are Tom Sawyeresque outsiders on a magical treasure hunt, and the story lands in the continuum between where “Our Gang” quests leave off and the darker spaces of Netflix’s recent “Stranger Things” pick up. Though it would be Spencer Tracy’s last film and the second film for which Katharine Hepburn would win an Academy Award for best actress, even these movie milestones are somewhat overshadowed by the then-novel plot of the 1967 “Guess Who’s Coming to Dinner.” Hepburn and Tracy play an older married couple whose progressiveness is challenged when their daughter (Katharine Houghton, Hepburn’s real-life niece) brings home a new fiancé, who happens to be black. Celebrated actor Sidney Poitier plays the young man with his customary on-screen charisma, fire and grace. One of the earliest “creepy clown” movies, “He Who Gets Slapped” was the first film produced completely by the MGM studio, though not the first released. The film features Lon Chaney in a memorable role as a scientist who is humiliated when a rival and his wife steal his ideas just as he is to present them to the Academy of Sciences. He then becomes a masochistic circus clown where the highlight of his act is being repeatedly slapped. One of many stand-out scenes occurs during a circus performance where Chaney spots those who betrayed him and tries to call them out, but his fellow clowns are doing their normal crowd-pleasing routine of slapping him in the face. Filled with nightmarish vignettes, this landmark film from the silent era was directed by Victor Sjöström (newly arrived from Sweden and using an anglicized last name of Seastrom) and also features Norma Shearer and John Gilbert, each on the cusp of stardom. This early actuality film documents New York City’s newest marvel, the subway, less than seven months after its opening. However, the film is not as simple as it first appears. It required coordinating three trains: the one we watch, the one carrying the camera and a third (glimpsed on the parallel track) to carry a bank of lights. The artistic flair is the vision of legendary cameraman G.W. “Billy” Bitzer. “La Bamba” is a biopic of the life of rock star Ritchie Valens, rock’s first Mexican-American superstar. Directed by Luis Valdez, “La Bamba” (the film draws its name from Valens’ signature song) charts Valens’ meteoric rise as a musician and his tragic death at age 17 in a 1959 plane crash, along with Buddy Holly and The Big Bopper. Lou Diamond Phillips stars as the late Valens. The film’s success not only reinvigorated interest in Valens’ brief but notable musical legacy, it also brought the title tune back to the charts (in a cover version by Los Lobos) 28 years after its first appearance. This innovative detective-murder, psychological puzzle (and director Christopher Nolan’s breakthrough film) tells its story in non-linear stops and starts in order to put the audience in a position approximating the hero’s short-term amnesia. 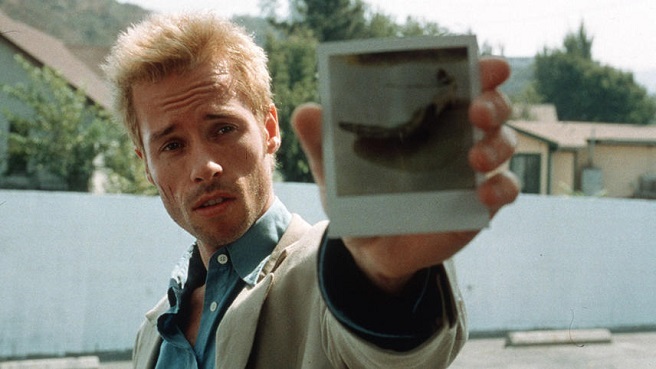 Guy Pearce tries to avenge his wife’s murder but his anterograde amnesia forces him to rely on sticky notes, tattoos and Polaroids. Nolan recounts, “My solution to telling the story subjectively was to deny the audience the same information that the protagonist is denied, and my approach to doing that was to effectively tell the story backwards … so the story is told as a series of flashbacks which go further and further back in time.” According to Nolan, he frequently intercut between the black-and-white “objective” sequences and “subjective” sequences in color. The goal was to show the conflict between how humans see and experience objective versus subjective and the complex relationship between imagination and memory. Considered the “quintessential” Howard Hawks male melodrama by many, “Only Angels Have Wings” stars Cary Grant as the tough-talking head of a cut-rate air freight company in the Andes. Grant has a dangerous business to run and spurns romantic entanglements, fearing women blanch at the inherent danger. Displaced showgirl Jean Arthur arrives and tries to prove him wrong. Along with sparkling dialogue from Grant, Arthur and renowned character actor Thomas Mitchell, “Only Angels Have Wings” captivates with dazzling air sequences featuring landings on canyon rims, ups and downs and perilous flights through foggy mountain passes. Even among the mega epics being produced by Hollywood at the time (such as “The Ten Commandments” and “Cleopatra”), “Spartacus” stands out for its sheer grandeur and remarkable cast (Kirk Douglas, Laurence Olivier, Jean Simmons, Charles Laughton, Peter Ustinov), as well as for Stanley Kubrick’s masterful direction. The film is also credited with helping to end the notorious Hollywood blacklist of the 1950s – its producer, Douglas, hired then-blacklisted writer Dalton Trumbo to author the script, which was based on a book by another blacklisted author, Howard Fast. Created in 1976 by Mort Jordan, a student at Temple University, “Time and Dreams” is a unique and personal elegiac approach to the civil rights movement. The filmmaker has described “Time and Dreams” as a personal journey back to his Alabama home, where he contrasts two societies: the nostalgia some residents have for past values versus the deferred dreams of those who are well past waiting for their time to fully participate in the promise of their own dreams. Through vignettes and personal testimonies, the film portrays Greene County, Alabama, as its people move toward understanding and cooperation in a time of social change. Film and TV actress Barbara Loden wrote and directed this affecting and insightful character study about an uneducated, passive woman from the coal-mining region of Pennsylvania, where the cinema verite-like film was shot. The title character possesses critically low self-esteem, leaves her kids and husband and then drifts aimlessly into a series of one-night stands and a dangerous relationship with a bank robber. Today, many consider this low-budget study of loneliness and personal isolation one of the finest works of independent cinema during the 1970s. This advocacy documentary about the Lincoln Brigade was shot during the Spanish Civil War to raise funds for bringing wounded American volunteers home. Some 2,800 Americans enlisted in the International Brigades to fight against fascism in defense of the Spanish Republic. The film was directed by Henri Cartier-Bresson with Herbert Kline and additional photography was provided by Jacques Lemare and Robert Capa. This film is held at New York University’s Tamiment Library and is part of a vast collection of materials in the Abraham Lincoln Brigades Archive.